Finfloor’s herringbone laminate flooring is a durable, hyper-allergenic laminate tile that is easy to install in a variety of patterns. 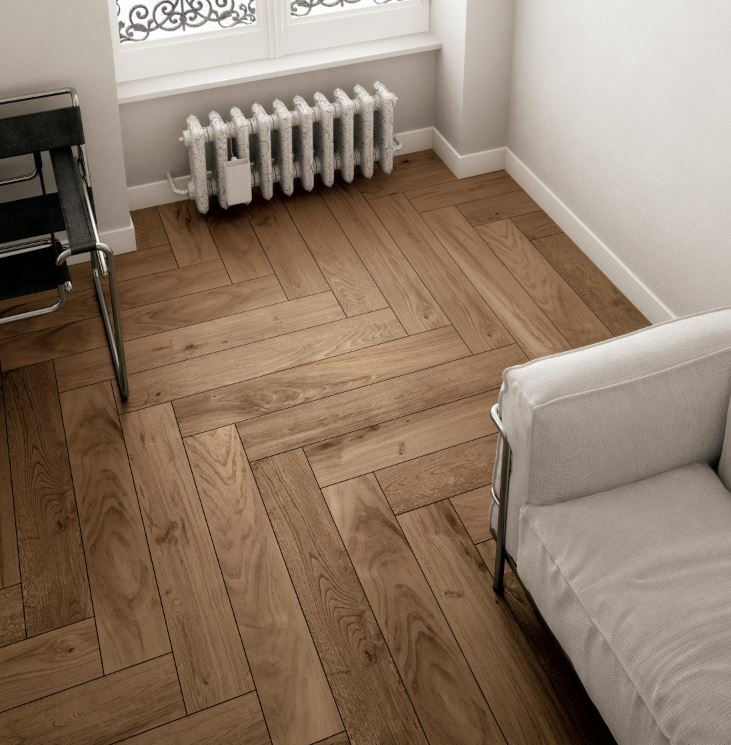 It offers designers a stylish, on-trend alternative to classic parquet flooring and is also easier to maintain, more convenient and more cost-effective. If you are working on a project that has green initiatives and goals, then Authentic Herringbone offers the ideal solution as this decorate laminate flooring exhibits great performance and excellent environmental compatibility. Starting with its manufacture, Authentic Herringbone is made of raw materials from renewable resources, namely Pine, Conifer and Spruce plantation forests as well as wood waste from the wood industry for the substrate. This eliminates the need to extract wood from natural forests, thus making Authentic Herringbone a natural product that is environmentally friendly and biodegradable. Using sophisticated technology, a photo of the real timber is taken and reproduced for the design layer. Wood decors are replicated to look like the original timber and give you that true-to-life wood look and feel without having to exploit our natural forests. Printed with non-solvent based inks that contain no heavy metals means this flooring does not emit any toxic fumes on combustion. Using a patented interlocking click system that allows for the planks to be joined in ten unique floor designs to suit your taste, your style and your home or office environment. Basket weave, Herringbone, Chevron can all be laid using this product. The factory in which the laminate flooring is produced makes use of reclaimed energy. Due to the large amount of thermal energy that can be extracted when burned, all the wood waste from the milling and sawing process is recycled to heat up the production facilities. It also contributes to a healthier environment as the surface is completely sealed and non-porous, thereby preventing the breeding of dust mites or micro-organisms.